RIO DE JANEIRO, BRAZIL – For the majority of foreigners arriving in Rio, the lively boulevards of Ipanema or the many beachside residencies overlooking praia de Copacabana are popular choices when it comes to finding a place to stay. However, those in the know and with the means also consider the luxury apartments situated along the tranquil waters of the Lagoa Rodrigo de Freitas to be the perfect lakeside retreat. 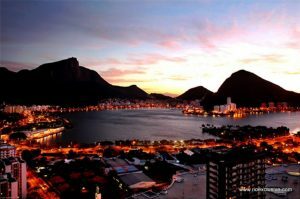 A panoramic view of Lagoa lit up against a dusky evening sky, photo by by Alex Bensimon/Rio Exclusive. The fact that the neighborhood, known simply as “Lagoa,” is situated in the heart of Zona Sul (South Zone) means visitors have easy access to Ipanema, Leblon, Copacabana and Jardim Botânico, plus a number of other exciting areas to discover in the Cidade Maravilhosa. Arnaud Bughon is co-founder of luxury real estate agency Rio Exclusive. With six lakeside properties featured, Rio Exclusive understands as much as anyone the value of a high-quality view. 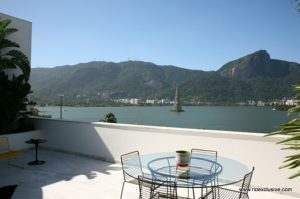 A view of the lake from the sun terrace of a Rio Exclusive Luxury Lagoa Penthouse, photo by Alex Bensimon/Rio Exclusive. The misconception of the Lagoa seems to be that there isn’t a great deal to do there. On the contrary, long-term resident Gabriel Fernandes, who moved to Rio in 2010, is particularly fond of the area he now calls home. Interest in the lakeside properties is set to increase as Christmas approaches. In December the Lagoa is lit up by a giant mechanical Christmas tree which moves around the lake on a motorized float and attracts both Cariocas and tourists to watch its grand opening. This is a really interesting article. It would be better if it included price per square meter for rent or buy and other specifics like parking, doormen services, cross streets, nearby restaurants and stores, etc.